The Ostankino TV tower in Moscow. 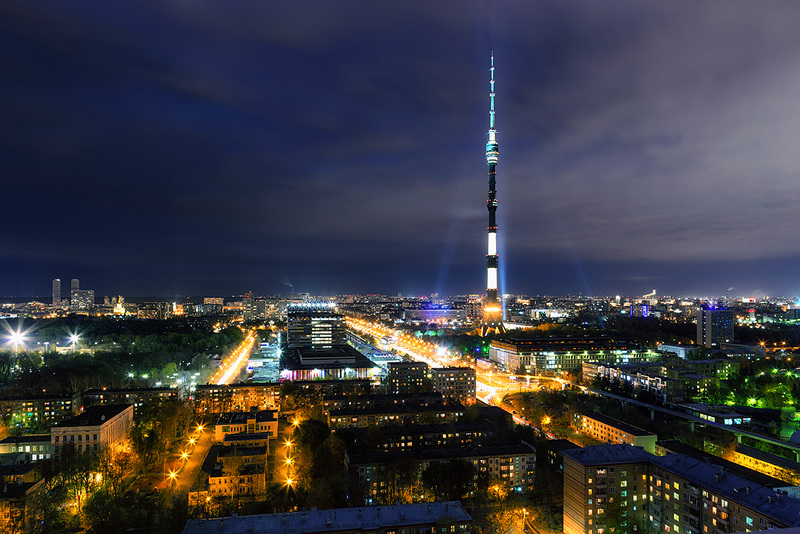 For the first time in many years, visitors to Moscow’s 540 meter tall Ostankino TV Tower will be able to admire the Russian capital from an open observation deck 85 meters above ground. Before, it was only possible to enjoy panoramas of the city from behind glass. Only meteorologists were previously allowed on the deck, but it’s now been opened up to the public. The higher deck - 337 meters - is sheltered from the elements behind glass. The tower is guarded like a government building.You can only come here if you obtain a personal permit. And just like an airport, you’ll have to empty your pockets of all sharp objects: So no knives, machetes, chainsaws, etc. - and of course no guns. Your visit must be reserved in advance: Do this by calling 8 (405) 926 61 11 or visit the official website. Be warned, only a limited number of tourists are allowed to visit the tower at one time - so book up before it’s too late. E-tickets can easily be purchased on the site. The earliest excursion begins at 10 a.m., the latest: 10 p.m.
As it stands, there are two options once you manage to get inside the soaring building. The first: Take the express elevator (42 seconds) to the closed observation deck. Here you can walk out onto the glass floor (this is where the acrophobia kicks in and your knees give way as you look down at the people below who appear like ants). The second option lets visitors visit the new, lower deck for some fresh air, as well as the first, sheltered platform. The cost of your visit will vary depending on what you do and how old you are. An adult: 1,000 rubles/$16.7). Child/student (500 rubles/$8.3). From 10 to 11 a.m. the prices are lower - 600 rubles/$10 for adults and 300 rubles/$5 for children and students. For the second itinerary (both observation decks) all tickets cost 1,500 rubles ($25). When navigating the website, make sure to enter your details (name, date of birth) exactly as they appear on your passport - security is tight! Pay, and that’s it, you’ll be sent an email confirming your ticket. Sadly audio guides are not included in the initial cost. Another warning: Children below the age of seven, pregnant women, people with prostheses or who use crutches or wheelchairs are not allowed to enter the building - this is in case it needs to be evacuated quickly. OK, you've successfully obtained your e-ticket. Now you must find the tower - which given the fact it looms large on Moscow’s horizon like a giant knitting needle shouldn’t be too hard. However, Ostankino is not near a Metro station so driving or taking the bus is the easiest way to get there. If you do feel like stretching your legs, you can walk from the closest station, VDNKh, which takes about 25 minutes. Ostankino Park surrounds the area, so if you do decided to go on a ramble you can soak up Moscow’s bucolic atmosphere along the way. If you catch a trolleybus (36 or 73) from VDNKh Metro you will reach Akademik Korolev Street in a few minutes - you can walk to the tower from here. Otherwise, take the monorail and get off at the Telecenter stop. It’s difficult to miss the stop: Ostankino Tower rises into the heavens before you as soon as you alight. The revolving restaurant is awesome. It occupies three floors 334 meters up and turns on its axis twice every 40 minutes so diners get the full panoramic view of Moscow. Expect to pay about 1,500 rubles ($25) per person for decent food. Inside the tower can also be found a small museum exhibiting interesting exhibits objects relating to TV transmission, as well as an old key telephone system and the construction mount for repairing the tower. Also, you will see that most Russian talk shows are shot in Ostankino, with eager crowds gathering outside the studios as each program starts. It’s possible to sign up as part of the audience, and you will even get paid for it.The only problem: The shows will all be in Russian!